Weapon of choice! Make sure that you choose wisely and are equipped with a graphics card custom fit to your specific needs. 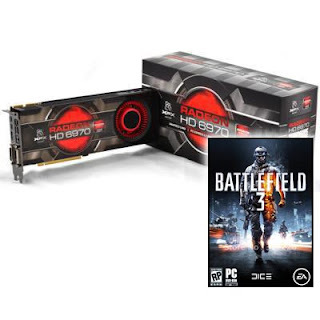 Which is why you’ll want the XFX AMD Radeon™ HD 6970 Graphics Card. The HD 6970 does what other cards can only claim: outperform its similarly equipped competition. This series of Radeon HD graphics cards is AMD’s 3-D gaming and multi-media solution for desktop computers, plus the next level of HDMI 1.4a and DisplayPort 1.2 solutions for Stereoscopic 3-D, including 2GB of GDDR5 memory. XFX also offers you additional versions with enhanced cooling solutions, plus overclocked editions of these cards to custom fit the specific needs of the gamer. No matter which version you choose, XFX makes sure you get to draw your weapon first.